Gator gets to ask the questions in his own articles. For example, you might want to check When Did The Rock and Soul Era End? and How Music Listening Has Changed. Open Discussion is set aside for Cats to start their own discussion threads. To be a good host, when a busy thread develops here, Gator reserves the right to move it to an article of its own, to increase its accessibility to everyone. 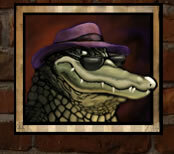 Same goes for individual comments: if a comment is directly on point to a conversation going on elsewhere on the Alley, Gator may move the comment there and leave a note here that it's been moved.